The possibilities are endless because He is limitless: " Now all glory to God, who is able, through his mighty power at work within us, to accomplish infinitely more than we might ask or think." 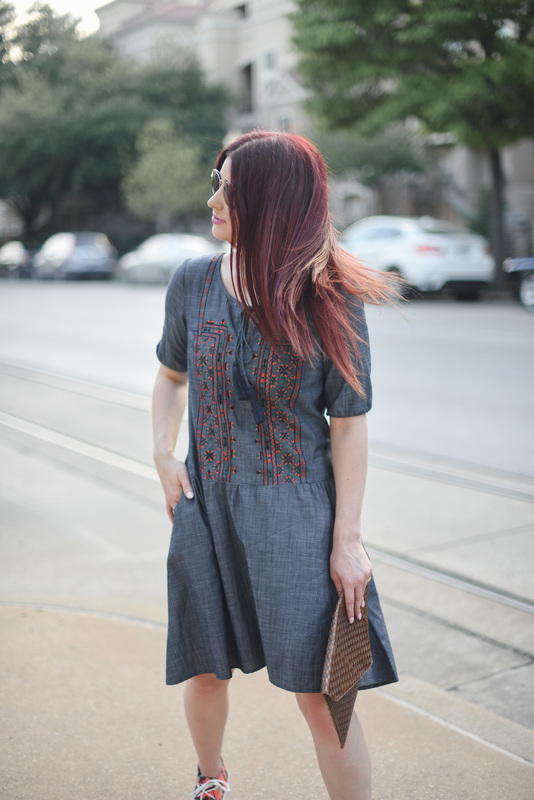 Today I'm sharing a chambray look from eShakti! They offer clothing in standard sizes from 0-36W, but what's super cool about them is that they offer customized clothing...what! This is perfect for the girl that might struggle to find the right fit when it comes to shopping, let alone online shopping...not anymore, because eShakti is literally made for you. You can also adjust the neckline, sleeve style and length, which is icing on the cake. They asked me to give their customization process a try and share about my experience. In full disclosure, I was provided with a free product in exchange for an honest review...all thoughts and opinions are my own. I wanted to throw some quirky accessories into the mix, so the camo kicks were the perfect pairing...plus, they're on sale for $20.50! Linking similar rose gold sunnies and woven clutches below. Customization - This dress was originally a three-quarter sleeve length, but I wanted something cooler for the summer months. Many short sleeves are nearly sleeveless, so the idea of an elbow length is unique and hard to find, but versatile for the various environments I find myself in. Returns - Return policies are really important when it comes to online shopping. It's one of the first things I look for when considering an online store or boutique. Even though I didn't need to take make a return or exchange with eShakti, it looks like they have a great policy. Free returns and exchanges (including pre-paid shipping) within 30 days, even when your piece is customized. Shipping - The only negative aspect of my dealings with eShakti wasn't even with eShakti directly...it was with DHL, the mail delivery service. (Insert all of the frustrated emojis here.) They wouldn't deliver my item without a signature (even though I'd requested that they not require a signature before the item ever shipped), which left me running around on a super adventurous scavenger hunt to pick up my item at the DFW airport. Overall, eShakti offers a unique approach to online shopping. One-of-a-kind fits at an affordable price and agreeable return policy...online. Thumbs up! Beware of DHL, though. I'm including a few screen shots from the customization process so you can see what it looks like! eShakti created a coupon code just for my readers! Receive 10% off when you shop, using code "jessicasheppard" (valid from 07/26/2016 – 08/28/2016). It looks like they're currently offering another discount on their site too...$30 off when you register as a new user. Hope you feel as special as I did having a dress tailor-made for me!